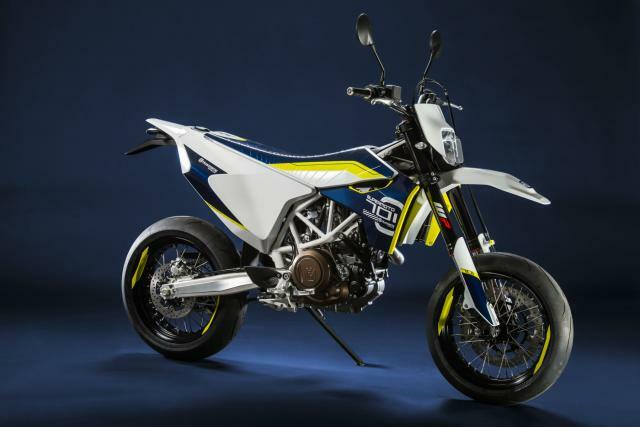 HUSQVARNA showed the concept version of its new 701 Supermoto last year and it’s proved that the bike was no flight of fancy by revealing the production version at this week’s EICMA show. In case it’s not clear, the ‘new’ Husky is very much a spruced-up version of the existing KTM 690 SMC R. And that’s a good thing, since it means its powerful, light and thoroughly modern. While 67bhp isn’t going to have Kawasaki’s H2R shaking in its track-only boots, it will be more than enough given the 701 Supermoto’s 145kg dry weight. Allied to tech including ABS, a slipper clutch, fly-by-wire throttle and switchable engine modes, the latest effort to bring Husqvarna to the road looks promising. In comparison, the KTM makes the same power and weighs 140kg dry. The similarity is no surprise, given the two share the same engine and frame, as well as pretty much identical WP suspension. The Husky does get an extra two litres of fuel capacity (14l vs 12l) plus different plastics, which explains the extra 5kg. The styling is pretty much what you’d expect; sticking to the usual motocross-derived supermoto cues. But then again, if you want to appeal to the supermoto crowd, there’s no point trying to reinvent the wheel in terms of looks. Prices haven’t been mentioned, but with the mechanically-identical 690SMC R coming in at £7,999, you don’t have to be a genius to imagine the Husqvarna is in the same league. The firm plans to put the bike on sale in late summer 2015.